It has been just over a month since we made resolutions. Statically speaking, we should be basically failing these by now. However, I think a huge part of the reason people do not accomplish their goals is that they have no one to answer to about them. We set goals and often don’t think about them again. I want to challenge you to think about the things you want to improve on. How can you continue to work toward those goals? If you didn’t set any last month, what can you set now? Here is my accountability so far. For a full look back on my goals, go here. I have not been perfect at filling this out daily, but it has helped make this goal easier. I have not read any biographies yet. Check! I am totally done with this. I am excited to have one goal totally done. I haven’t officially started on this. I have gotten rid of three boxes of clothes as I have given baby clothes away, but I haven’t officially worked on this. I will probably wait until it is warm because our storage room is a COLD storage and I don’t like cold. I have been able to do this. The grid diary helps a lot! I can write daily if I remember to each night, but I at least get one day in a week. 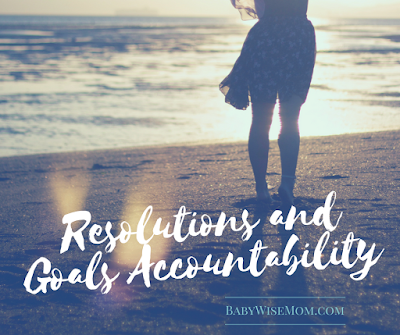 If you would like to join in on the accountability, share how your goals are going. If you don’t want to publicly share, at least think about it for a bit and self-evaluate.